Bird watching from the comfort of your home on a late fall or winter day is one of life’s quiet pleasures. Whether you see a bright yellow American Goldfinch, the red cap and breast of the Common Redpoll or an ordinary sparrow depends upon where you live — and partly on what kind of bird feeder you have, as we’ll see in a moment. The change to cooler temperatures means birds will be hungrier because there won’t be as much to eat (especially in the north). As days grow shorter, birds have less time to search for food. So late fall and winter may be the best time to attract birds to your backyard bird feeders. 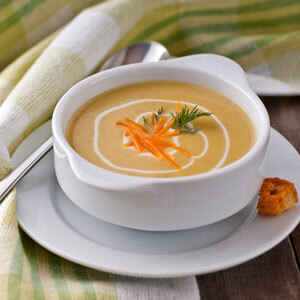 Birds can still flourish in cold weather with the right food. They need seeds with a high fat or oil content that will provide abundant energy for winter survival. 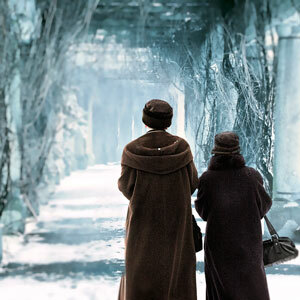 Remember that winter birds are fickle; they’ll only stop by as long as you feed them. The following bird feeders caught our fancy because of their outdoor decorating potential, but some will work better in a snowy climate than others. 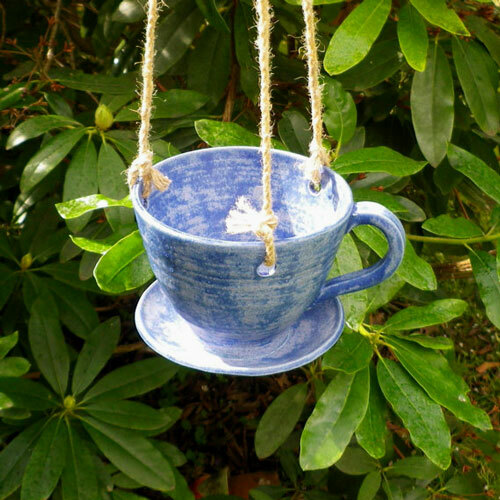 It’s hard not to love this one, a handmade Tea Cup feeder sold on Etsy.com by BellaHeartTreasures. Here, the tea saucer becomes a tiny table and the tea cup partially protects the birdseed. Speaking of tea, this next feeder is from the United Kingdom. The creator, Susan Frankel, and her London shop, CaractacusPots, is also on Etsy.com and ships to the U.S.
Susan says her feeder can be left outside year round, and also that it’s dishwasher-safe, which seems convenient. 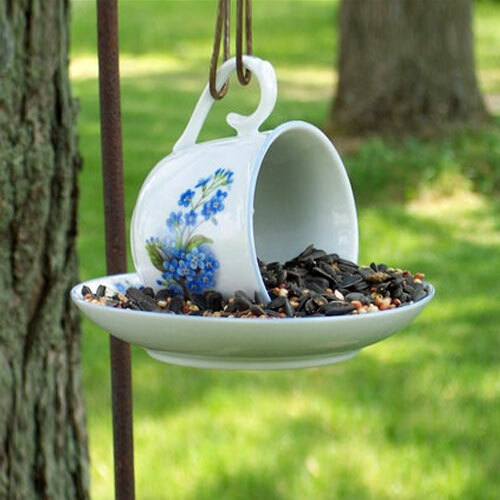 Both these tea cup feeders hang, rather than use a supporting pole, which makes them great for small, nimble birds like chickadees and goldfinches — and for winter birds like Common Redpolls and Pine Siskins. These last two birds — the Pine Siskin and Common Redpoll — are finches, a family consisting mainly of seed-eating songbirds, many of which head straight for bird feeders when the weather turns cold. 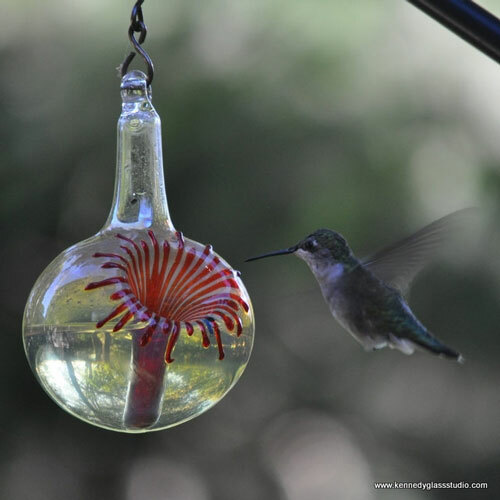 Winter and hummingbirds are about as synonymous as blizzards and Kauai. But that said, a lot of hummingbirds stay in the U.S. during the winter, many heading towards Miami or Houston. 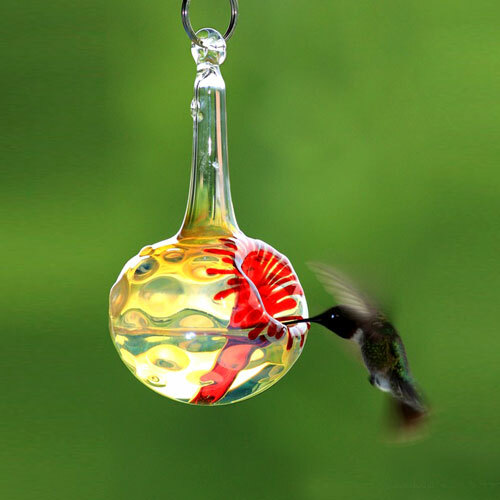 Kennedy Glass Studio makes hummingbird feeders so lovely they could probably retail simply as hanging glass décor or sculptures, which they are. (The first one here was photographed by J. Marty Paige). But they also appear to be well-designed and effective hummingbird feeders (the raving customer reviews on Etsy support this). According to the studio, the feeders don’t drip (and thus don’t attract ants). 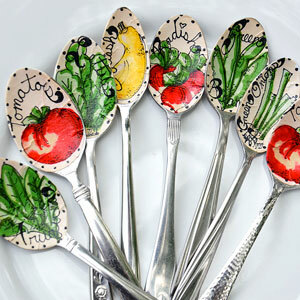 They’re also easy to rinse and clean, critical for preventing bacteria and fungus. Here’s another Kennedy Glass Studio beauty — one of roughly 20 hummingbird feeders in their shop. I admit I’m smitten by this photo by Ed Goldman, which won Kennedy Glass Studio’s 2011 photo contest. 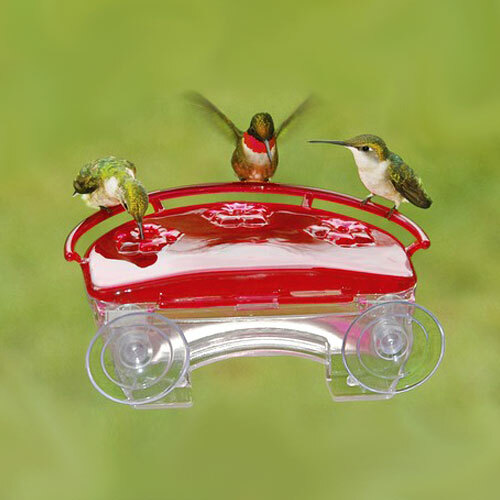 I also like the design of the feeders themselves, which resemble the kind of red tubular flowers, like trumpet honeysuckle, that hummingbirds love. 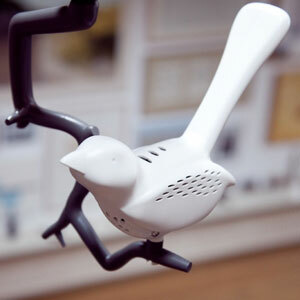 Less sculptural is the Jewel Box Hummingbird Feeder from Veseys, which brings the hummingbirds closer to you and makes them the décor, but with some clever twists. This feeder sticks right to a window thanks to a couple of suction cups. I’d be skeptical of it falling off IF it weren’t for Vesey’s image of the hardware — while I haven’t used the product, the image shows a solid, well-designed structure. One clever detail is an “ant moat” to keep an army of insects from invading the dish. And a thoughtful element is that the dish itself is a translucent red, hopefully discouraging people from using red sugar water — a no-no, according to the Cornell Lab of Ornithology. 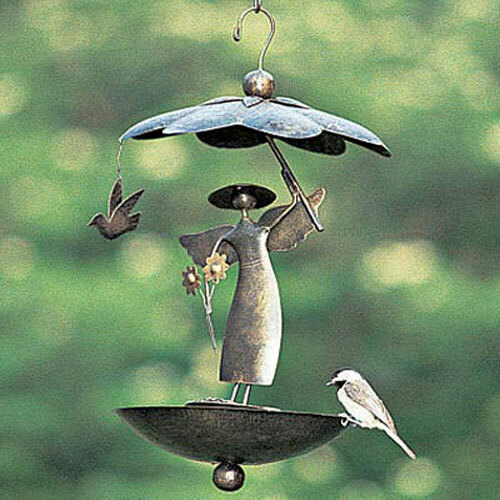 A few other feeders caught our eye… This Garden Angel Bird Feeder, sold by Plow & Hearth and handmade in Bali, is listed as of this writing as “not available”. It’s lack of availability may be due to quality problems mentioned in the store’s reviews. Even if it never sees the light of a web shopping cart again, the product remains a beautiful design concept. In theory, it’s not only lovely, but a good hanging feeder for smaller winter birds. 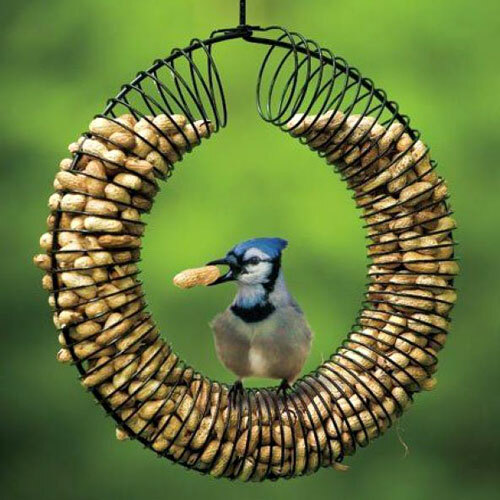 If eclectic, cleverly-repurposed décor is up your alley, you may like this peanut wreath feeder from the Canadian website Vesey.com. It resonates with people — in over two years of posting photos on our Facebook page, this one, in popularity, was one of the top three. It hold peanuts — and works well for holding suet in the winter. And if you’re in a holiday mood, you can put a ribbon on it for a nice look. It’s no accident that you’re seeing a Blue Jay, a bird that loves nuts so much, a number of tree species (including oaks) depend on it to spread acorns and seeds. Yes, Blue Jays are noisy, but they’re beautiful too; a striking blue-and-black combination with a black “necklace” pattern. Although some Blue Jays migrate, others stay for the winter. 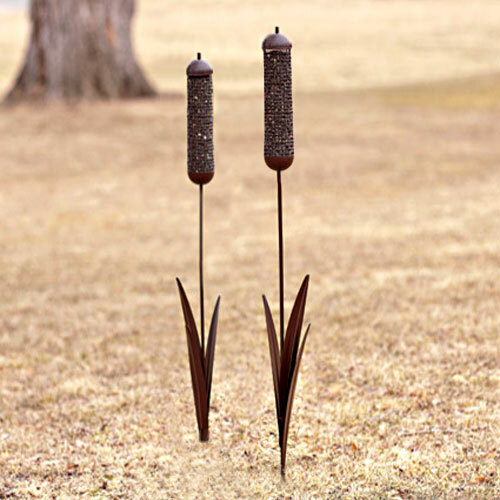 We saw these cattail bird feeders on a page on Houzz.com — and the indication was you could buy them at White Flower Farm. But although White Flower Farm has some nice-looking bird feeders and birdhouses, these aren’t there. The same product, or one that looks similar to me, is available on Home Depot’s website. These are “ground feeders” that are close to the lawn, and they attract different birds than hanging feeders. In particular, they attract sparrows — which is convenient, since the tree sparrow usually migrates north in the fall, adding to the variety of winter birds. This feeder has wire mesh to keep squirrels from eating the food, and to help smaller birds have a chance to eat. Have a favorite bird feeder in your backyard? 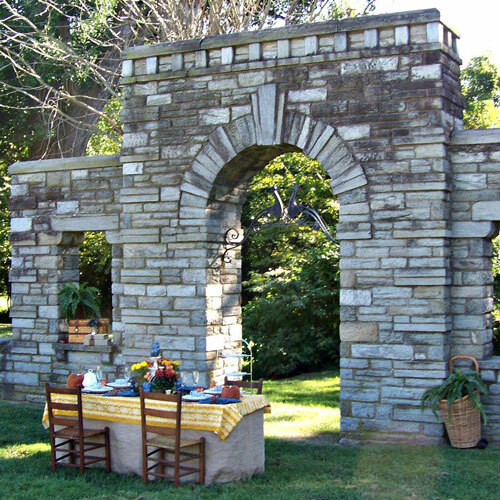 Don’t hesitate to post it on our Bombay Outdoors Facebook Wall!